Written by Georg Holzmann on April 22, 2015 in News. We just released version 1.4 of the Auphonic Leveler Batch Processor with many new features and fixes, including a new preset system, much faster processing (parallelization), algorithm improvements and more. 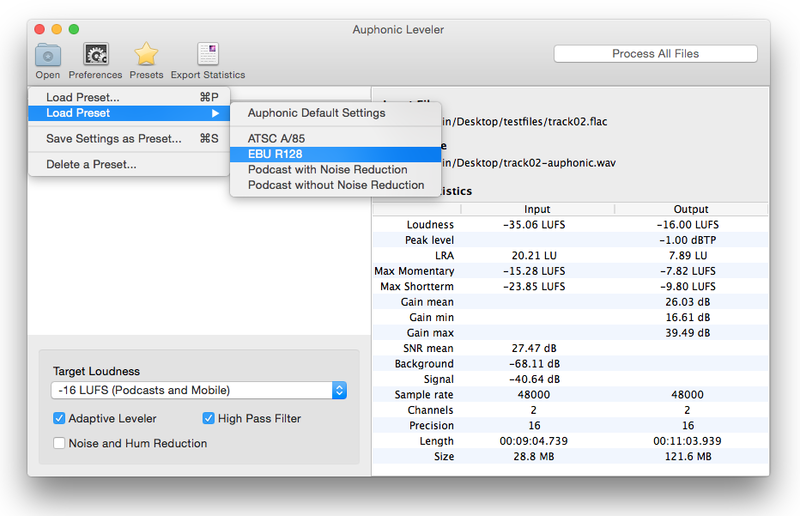 Screenshot of the Auphonic Leveler 1.4 with menu to load, save and delete a preset. Algorithms are now computed in parallel, also if you only process one single file. This brings a big speed improvement when processing only one long recording, like for example a long podcast. It is now possible to create, load and manage presets in the Auphonic Leveler desktop program – see the screenshot above for details! All audio algorithms come with many improvements, fixes and updated classifiers with data from our web service. As many requested this feature, we added the possibility to generate a mono mixdown of the processed audio files. You can now select a directory on your computer, where Auphonic puts its temporary files during processing. Choose a directory on a SSD for faster processing! We added a few additional loudness targets, for example -19 LUFS. The auto update feature, introduced in version 1.3, did have some problems on OS X which are fixed now. Mac users of version 1.3 still have to update manually for the last time – on Windows everything works as it should! On OS X 10.9 and 10.10, the menubar was sometimes not visible at first startup – this is fixed now. Apple introduced a new code signing system for OS X 10.9.5 and later. We changed to the new system – you should not get any warnings by gatekeeper anymore! If you already purchased the Auphonic Leveler or want to try it, then download the latest version here!